Winning Prize: 1 package of Abeego reusable beeswax food wrap, 1 case of Blume Honey Water. (12 bottles!) U.S. Entries only please. Celebrate World Health Day in full Blume! Enter our Instagram Giveaway for a chance to win a jar of Spring Honey and a case of our healthy hydrating Honey Waters.🌸🍯💦 Contest begins 4/7. Winning Prize: 1 case of Blume Honey Water. (12 bottles!) U.S. Entries only please. As a women-owned business we're celebrate all women who are following their dreams and bringing new ways of doing business to life. Giveaway Begins 3/7. Winning Prize: 1 Queen Bee Tshirt and 1 case of Blume Honey Water. (12 bottles!) U.S. Entries only please. The sweet smell of Spring is in the air! Blossom with our Blume Giveaway happening on the first day of Spring, March 20th. #liveinfullblume🌸🍯💦 Giveaway begins on 3/20. ALL 3 steps must be complete to qualify. The contest ends Thursday 3/21 at 6pm. The winner will be announced on our Instagram Story. ALL 3 steps must be complete to qualify. The contest ends Wednesday 2/14 at 6pm. The winner will be announced on our Instagram Story. ALL 3 steps must be complete to qualify. The contest ends Friday 2/9 at 6pm. And the winner is: @teresahopecovey of Seattle, WA! December 18th is National "I Love Honey" Day and we will be celebrating with a special giveaway! Watch for alerts on our Instagram page! Winning Prize: 1 flight of honey varietals (pictured left) and 1 case of Blume Honey Water. (12 bottles!) U.S. Entries only please. The lucky winner is @katiesav1 of Cranford, NJ! Don’t forget to do ALL 3 steps to qualify and confirm your subscription via email. The contest ends Thursday 12/7 at 4PM. The winner will be announced in our December Newsletter on 12/8. November Insta Giveaway #1: Nov 6-8th. November Insta Giveaway #2: Nov 14-16th. The lucky winner who will receive a mixed case of Blume is: @spagetti.squats of Massachusetts. Thanks to all who participated! The lucky winner who will receive all 15 pieces of the prize is: Stephanie Maganelli of Hoboken, NJ! October Insta Giveaway, on October 24th-26th. 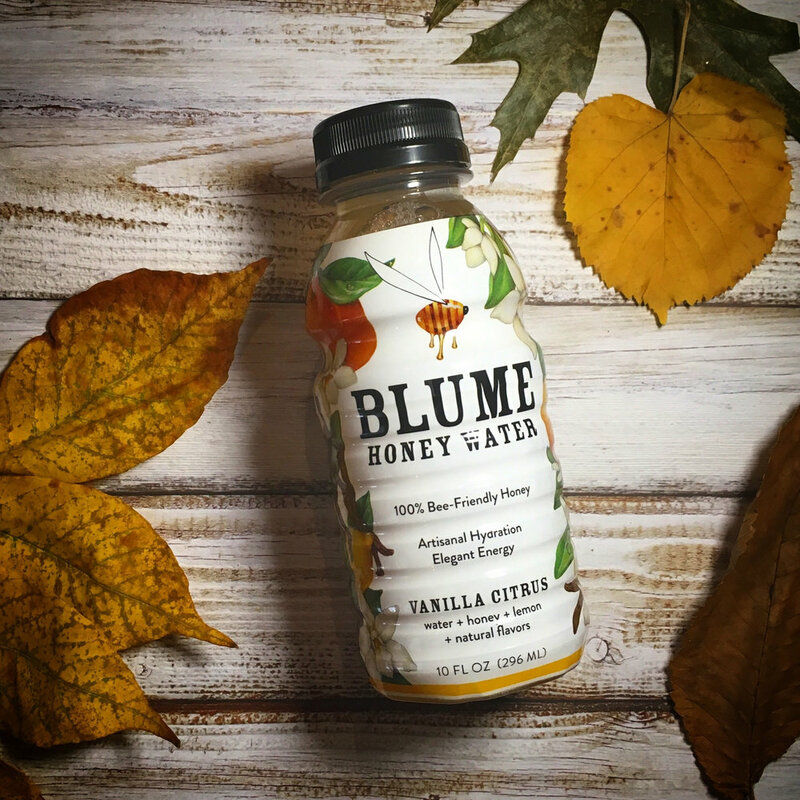 Winning Prize: 2 cases of your favorite flavor of Blume Honey Water. (24 bottles!) We will announce the winner on our Insta stories on Oct 27th. The winner will be chosen at random. The lucky winner is: @anna_danner of Buffalo, NY! **** This contest is closed *****Take us with you on your August adventures and share your photos of Blume in your get-away landscapes. Be sure to use #BlumeWithAView and tag us @blume_honeywater! Three winners will be announced in September who will receive a case of Blume. Wishing you safe and happy travels! From August 19th - August 30th 2017 you took us with you on your adventures and shared your #BlumeWithAView. Thanks to all who participated! The winner is Ingrid Peterson of Boulder, Co. whose winning photo is Blume with the field surrounded by mountains. Thats a beautiful #BlumeWithAView! Watch for more #BlumeWithAView contests in the future. **** This contest is closed *****Our #BeeKindGarden initiative brings focus on simple, delightful ways we can all participate in providing a healthy environment for bees -- right in our own backyards! From April 3rd to August 17th 2017, Through our social media channels, Blume Honey Water taught fans which flowers are bee-friendly, how to avoid using pesticides, how to make a bee bath and so much more! It underscored the need for healthy food sources for bees and how that benefits us all. Now we really can blossom and Blume together! Contest Winners: James Deskavich, Sarah Mangerson, Susan Blair Howard, Elisa Bosley, Catherine Talese, Joy Heyrman, Foodfuelphoto, Hive1080.bee.haven. Watch for new #BeeKindGarden Contests next Spring!